Objectives: To introduce students to the significance of masks in virtually all cultures, while allowing them to gain experience in a sculptural technique using papier-mâché. Goals: Students will create a unique mask in papier-mâché. Masks have been made by virtually every culture in the world for a number of reasons. The video "Masks and Face Coverings" is a good introduction to the diversity of styles and purposes of masks. Students may choose to make any style or type of mask. Some may choose to make a mask typical of their culture or ancestral heritage, some may choose to make a mask that simulates functional mask (such as a hockey mask or gas mask), etc. While specific instructions can be given for this project, I found the variety of the students’ designs to be interesting. 1. 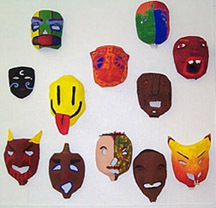 View the video "Masks and Face Coverings," and show examples of student-made masks. 2. On practice paper, design the overall concept for the mask. 3. Choose half of a gallon milk container that will best provide the foundation for the style of mask to be created. Areas may be built up by taping wadded up newspaper to the form prior to applying the papier-mâché. 5. Using strips of newspaper coated with wheat paste (demonstrate how to remove excess paste), begin applying to form, making sure that strips wrap over to back of form. 6. Apply approximately 3 to 6 layers of newspaper, allowing to dry when it becomes saturated. Try to keep areas smooth to create an even surface. 7. After newspaper has been applied and has dried, apply one layer of paper towel strips to form, again trying to create a smooth surface. 8. When dry, apply one coat of gesso to the mask to harden and give a better surface for painting. 9. Using tempera, paint as desired. Note: This was part of a unit on mask making. Students were also required to read a brief teacher-written article on masks, and answer questions about the reading. Additionally, a group critique would be valuable—have students tell about their mask (what it symbolizes, why they chose the colors they did, etc.) and/or write about it.